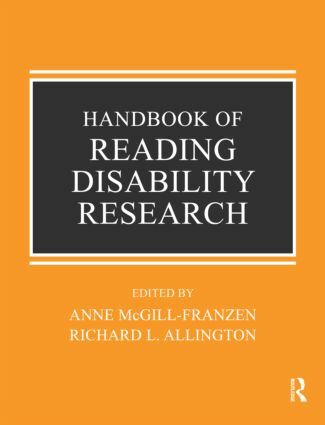 Bringing together a wide range of research on reading disabilities, this comprehensive Handbook extends current discussion and thinking beyond a narrowly defined psychometric perspective. Emphasizing that learning to read proficiently is a long-term developmental process involving many interventions of various kinds, all keyed to individual developmental needs, it addresses traditional questions (What is the nature or causes of reading disabilities? How are reading disabilities assessed? How should reading disabilities be remediated? To what extent is remediation possible?) but from multiple or alternative perspectives. Taking incursions into the broader research literature represented by linguistic and anthropological paradigms, as well as psychological and educational research, the volume is on the front line in exploring the relation of reading disability to learning and language, to poverty and prejudice, and to instruction and schooling. The editors and authors are distinguished scholars with extensive research experience and publication records and numerous honors and awards from professional organizations representing the range of disciplines in the field of reading disabilities. Throughout, their contributions are contextualized within the framework of educators struggling to develop concrete instructional practices that meet the learning needs of the lowest achieving readers. Anne McGill-Franzen is Professor and Director of the Reading Center at the University of Tennessee. She was recipient of the International Reading Association Nila Banton Smith Award, co-recipient (with Dr. Richard L. Allington) of the IRA Albert J. Harris Award for research published in the field of reading disabilities, and the 2004 recipient of the IRA Dina Feitelson Award honoring an empirical study of language and literacy acquisition with clear implications for instruction. Dr. McGill-Franzen was a member of the Board of Directors of the National Reading Conference, serves on the editorial advisory boards of several major journals and was Technical Consultant for the UNESCO funded project on diagnostic teaching of reading in Kenya, Ghana, and Tanzania. Richard L. Allington is Professor of Education at the University of Tennessee. He has served or serves on the editorial advisory boards of Reading Research Quarterly, Review of Educational Research, Journal of Educational Psychology, Reading Teacher, Elementary School Journal, Journal of Literacy Research, and Remedial and Special Education. A past president of the National Reading Conference and the International Reading Association, he was co-recipient (with Dr. Anne McGill-Franzen) of the Albert J. Harris Award for contributions to improving professional understanding of reading/learning disabilities, and was elected to the Reading Hall of Fame.